(Lilac) Syringa ‘Sensation’ is an amazing new Lilac with its sensational single purple florets that are edged in a white trim. Occasionally ‘Sensation‘ does sport a white flower. This mid-season bloomer has a light scent. Standing 12 foot tall and 8 foot wide ‘Sensation’ boasts loads of flowers, excellent for picking and creating a beautiful bouquets. Add in the bonus of butterflies and hummingbirds and this Lilac is a true ‘Sensation‘! The welcoming scent that spring is here comes from the beautiful Lilac Bushes. Bloomerang™ Purple Syringa x ‘Penda’ Lilac is a new one of a kind, dwarf, repeat blooming variety of lilac that offers that great scent you welcome in the spring, all summer long. Bloomerang™ is a repeat bloomer. Although you will get the mass of blooms in the spring, Bloomerang™ will give you flowers all summer long for your repeat pleasure. 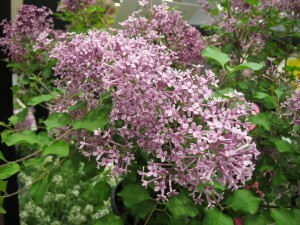 The compact size of this great new lilac make it easy to plant in almost any space in your garden. Once you plant one, you will come back for more! 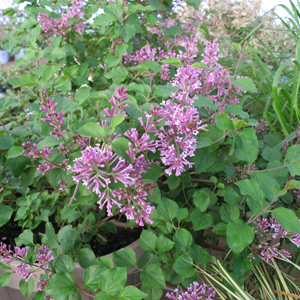 Last week when I was at a Garden Show I saw Lilac Bloomerang™ Purple Syringa x ‘Penda’ planted in a 2 gallon pot. The plant was so gorgeous, full of blooms and the scent was absolutely amazing. Bloomerang is the first re blooming Lilac and a Garden Crossings top seller! (Lilac) Bloomerang™ Syringa is a one of a kind, compact, reblooming Lilac. In the spring massive amounts of purplish-pink flowers emerge. While traditional lilacs bloom for only a few weeks in spring, Bloomerang’s fragrant flowers continue until frost. The flowers just keep coming back for your pleasure. The compact habit makes this Lilac a must have for your garden or landscapes. A Proven Winners® ColorChoice® Flowering Shrub.